"Don't worry, we'll take care of you." Cleopatra Entertainment has debuted the official US trailer for quirky British coming-of-age drama Pin Cushion, a film about a mother and daughter drifting apart. This is the feature debut of an award-winning shorts filmmaker named Deborah Haywood, and it first premiered at the Venice Film Festival last year. Lily Newmark (also seen in Juliet, Naked and Solo: A Star Wars Story) stars as a young girl raised by her strict, very close, kooky but loving mother. She reaches a point where she feels the need to go out and make new friends, but in the process everything starts to fall apart. Joanna Scanlan stars as her mother, and the cast includes Loris Scarpa and Sacha Cordy-Nice. I saw this film in Venice last year and it's very weird yet oddly endearing, but a bit too dark and melodramatic for my taste. Super close Mother Lyn and daughter Iona (Dafty One and Dafty Two) are excited for their new life in a new town. Determined to make a success of things after a tricky start, Iona becomes 'best friends' with Keely, Stacey and Chelsea. Used to being Iona's bestie herself, Lyn feels left out. So Lyn also makes friends with Belinda, her neighbour. As much as Lyn and Iona pretend to each other that things are going great, things aren't going great for either of them. Iona struggles with the girls, who act more like frenemies than friends, and Belinda won't give Lyn her stepladders back. Both Mother and Daughter retreat into fantasy and lies. 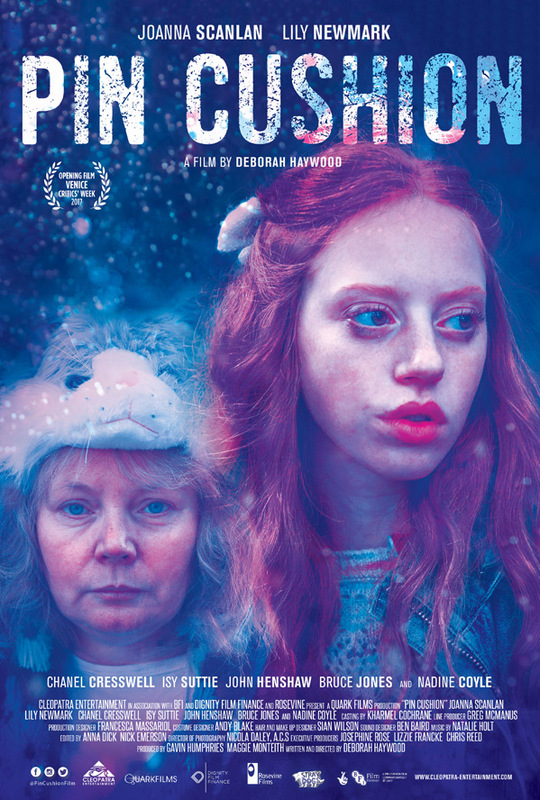 Pin Cushion is both written and directed by up-and-coming British filmmaker Deborah Haywood, making her feature directorial debut after a number of award-winning short films previously. This first premiered at the Venice Film Festival and at Fantastic Fest last fall. Cleopatra Entertainment will open Haywood's Pin Cushion in select US theaters starting on July 20th this summer. Anyone interested?